Potting soil is a mixture of soilless components that support plant life. Unlike the soil in a garden bed, potting soil doesn't contain soil in the traditional composition of sand, clay and silt. Potting soil consists of peat moss, mineral perlite, ground bark and coarse sand. Gardening with potting soil involves use of this specialized medium in container gardens and for starting seeds. Check the status of the drainage holes on the bottom of the planting container. Look for holes spaced every 5 to 6 inches along the bottom of the pot. Punch extra holes if needed to provide consistent drainage through the pot bottom. Clean the container completely. Gardeners use potting soil as a container garden medium because the material is relatively disease free. Some varieties of potting soils are sterile. A clean pot limits the chance of disease or fungus transfer to newly cultivated plants. Fill the container with fresh potting soil directly out of the bag. Plant perennials, annuals or shrubs according to grower recommendations provided on the plant label. Always fill containers with potting soil to 1 inch below the pot rim. 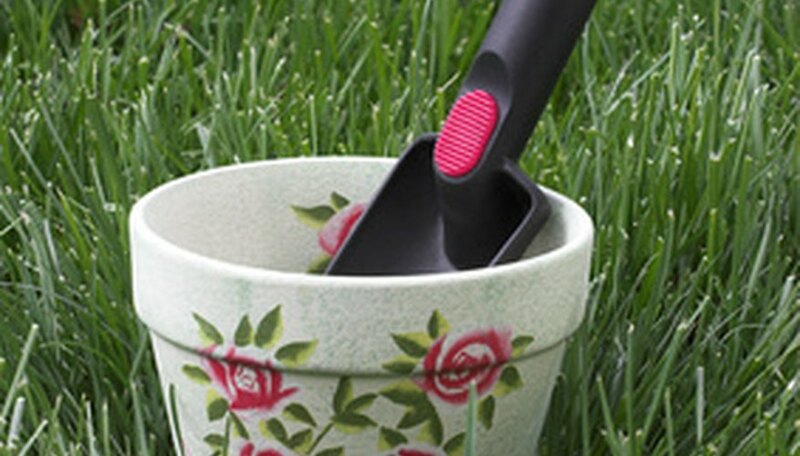 This allows room for watering without splashing soil onto the outside of the pot. Water container-grown plants after the completion of planting. Loose, dry potting medium is easier to work with when creating a container garden. Cultivate the soil in a square foot area of the garden to a depth of 8 inches. Dig a foot-long trench in this loose soil to a depth of 4 to 6 inches in the garden bed. Remove the soil and spread it around the garden bed. This method can be used in the garden to sow seeds after the last chance of frost. Scoop a few cups of potting soil into the trench. This loose material is perfectly suited for small seeds. Garden soil is heavy and thick and may restrict seedling growth, especially if the garden bed is covered with mulch. Potting soil provides a light, fluffy medium that enables excellent soil-to-seed contact needed for germination. Plant seeds according to the recommendations on each seed packet. Place a light layer of potting soil over the seeds if requested in the planting instructions. Water with a sprinkling watering can to keep soil evenly moist. After seedlings emerge, thin out the weakest plants and increase the space between plants based on grower requirements. After the seedlings are 3 to 5 inches high, they can be moved to other parts of the garden. Make sure to blend the potting soil into the planting bed to disperse it evenly.